Mort Kunstler Handsigned and Numbered Limited Edition Giclee on Canvas:"Chief Joseph Surrenders"
Edition: Artist Signed and Numbered, Limited Edition to 50. COA included. About the Art: From the first landings at Jamestown and Plymouth, settlers had been at war with the Native Americans. One of the most tragic chapters in this perpetual warfare was the expulsion of the Nez Perce (the Pierced Noses) from their ancestral lands in Idaho. These Native Americans had welcomed Lewis and Clark as early as 1804, and then missionaries. But when settlers of the 1870s invaded the Nez Perce lands looking for gold, and the U.S. Government attempted to drive the Nez Perce out of their reservation. They fought back under the leadership of the remarkable Chief Joseph. The Nez Perce fought in vain. Hoping to find refuge in Canada, Chief Joseph led his tribe on a trek over one thousand miles through the Rocky Mountains. 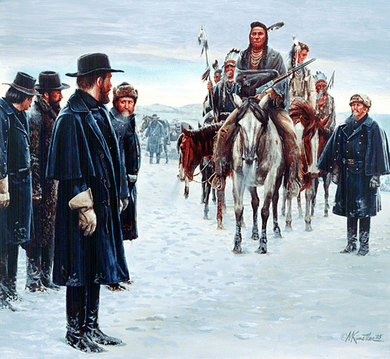 Thirty miles from his goal, General Nelson Miles caught up with him in the Bear Paw Mountains. Vastly outnumbered, Chief Joseph fought bravely but was forced to surrender against overwhelming odds. The speech attributed to Chief Joseph at his formal surrender remains one of the most moving in the history of American eloquence: I am tired of fighting. Our chiefs are killed... The old men are all dead. It is the young men now who say "yes" or "no"� It is cold and we have no blankets; the little children are freezing to death. My people, some of them, have run away to the hills, and have no blankets, no food. No one knows where they are - perhaps freezing to death. I want to have time to look for my children, to see how many I can find. Maybe I shall find them among the dead. Hear me, my chiefs! I am tired; my heart is sick and sad. From where the sun now stands, I will fight no more forever. Still in exile from his homeland, Chief Joseph died twenty seven years later, according to his doctor, "of a broken heart.